Preheat the oven to 190C/fan oven 170C. Using a short, sharp knife and a teaspoon, scrape out a little flesh from each half of squash above where you removed the seeds (leave a 2cm thick edge). This will give you more room for the stuffing. Reserve the flesh and chop. Spray each squash half with low fat spray and wrap loosely in foil. Place in the oven for45 minutes or until very soft when pierced with a knife. Meanwhile, heat a large, heavy based nonstick pan with the olive oil. Add the onion and reserved chopped squash and cook for 8-10 minutes until starting to soften and colour. Add the garlic and cook for 1 minute more then stir through the rice and curry powder, mixing everything together well. Add the stock, cover and cook on a low heat for about 12 minutes or until the rice is just cooked. Add the grated apple, raisins, pine nuts, Parmesan and parsley to the rice and stir together, seasoning to taste. 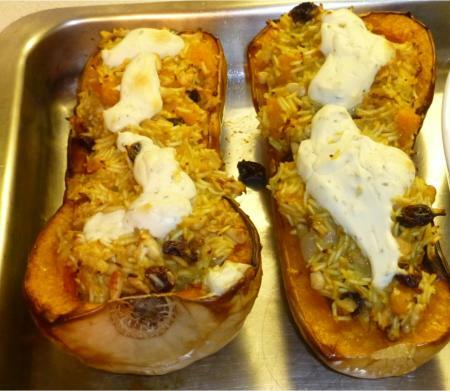 Open the foil around the squash halves and divide the rice mixture between them. Dot each half with a tablespoon of the soft cheese. Bake uncovered for 15 minutes then serve with a large salad or steamed vegetables. Note: If you have some rice mixture left over once you have stuffed them. Simply keep warm then serve on the side.